The issue, and in fact the very idea, of bee death and colony collapses – a constant feature of the news for a number of years now – is deeply worrying and unsettling: how will we all survive, if the pollinators die – the pollinators of the very crops that we need in huge amounts? The most recent addition to the record of bad news in this regard, as to be published in the UN’s Intergovernmental Panel on Climate Change (IPCC) report, is our growing understanding and appreciation of the impact of climate change on food security. Long-term changes to our climate may have a significant impact on the cycles of the life of animals and plants, including that of plants and bees, and it remains to be seen just how easily pollinators will be able to adapt their life cycles to a changing dynamic of the flora. The study of evolution has taught us, of course, that nature is likely to find a way to respond to changing environments (though not, perhaps, to the rapid changes inflicted to it by human civilisations). This raises an interesting question: considering that we cannot actually predict how nature is going to change (and to cope) with the ongoing threat to current types of pollinators, how come we feel so strongly about them? Clearly, popular responses to issues such as bee death and colony collapse are not informed first and foremost by the fundamental understanding of the relevance of pollination alone. Much rather, it would seem that, the life-threatening significance to one side, the concept of ‘bee death’ in itself has an almost poetic – fundamentally tragic – ring to it. The honey bee is an animal that to us, perhaps like no other, is associated with life and the sweetness of life itself. The mythic symbolism of the bee is ancient and complex. The Roman poet Vergil, in a famous passage of his Georgics, celebrates the bees – as an instructive foil for human life, labour, and statal organisation (georg. 4.1–280). Amantes ut apes vita(m) mellita(m) exigunt. So how can these animals, in the phrase ‘bee death’, possibly be brought together with something as cruel and terminal) as death . . . ? Interestingly enough, in ancient Greece and Rome, bees played a major role in funerary cults – as a symbol of hope, afterlife, and resurrection. contigit et cunctis auxilians bonitas. quod te festinans apstulit atra dies. in quis purpureus perpetuusque dies. texeruntque favi de Siculis apibus. (…) so dutiful, so lucky, so happy a life he held, and a good nature that came to the help of everyone. But us hurts this pain, deep inside, and dutiful care, for a black day snatched you away rapidly. Spirits of the Underworld, I beseech you, give our father a grove in which there is crimson, eternal daylight. Here, as he deserved, every care has been given to the tomb itself, covered in honeycomb from Sicilian bees. This must be seen in conjunction with a couple of texts – again poetry from Roman tombstones – that reflect on the ‘secondary’ (involuntary, yet poetic) use of funerary monuments as nesting site for wild bees. set conclusa decens apibus domus ist[a vocanda]. hoc plus quam dolor est, rapta est specios[a puella]. vixit enim ann(os) XVII et menses VII diesque XVIII. o felice patrem qui non vidit tale dolorem. et iunctam secum Geron pater tenet ipse puellam. For Aelia Aeliana. You, who know the letters, read of a girl’s fate and feel the pain: many call a sarcophagus what consumes the limbs: but one must call this a house for bees, shut, and proper. Oh, here lies – an unworthy sacrilege! – a beautiful girl: this is more than just pain, an attractive girl has been snatched away. The girl lived to enjoy aspects of maturity, she announced her marriage, the parents were delighted over the pledge: for she lived 17 years, 7 months, and 18 days. Oh lucky father, who did not get to see such pain. Dionysias, the mother, has a wound tacked onto her heart, and, united with himself, Geron, the father, himself holds the girl. The poem, expressing a mother’s mourning over the loss of her daughter (and her husband), playfully explores the term ‘sarcophagus’ (literally: ‘flesh-eater’), suggesting that this is in fact a misnomer: the coffin does not (or so the inscription suggest) consume the flesh of the dead, it gives a home to the bees, who will eventually inhabit this as their decens domus, their proper home. 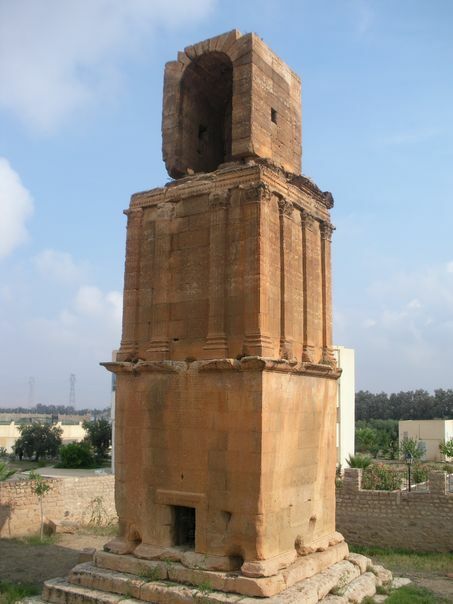 The same idea is driven to an even higher level, adding olfactory sensations to the artifice, in a famous, very long poem from the extraordinary monument of the Flavii at Kasserine (Cillium). Driving the imagery just as much to an extreme as the entire monument, this poet sees the way in which a stone structure allows nature to take its course as an act of ancestor worship: bees that nest in the monument will eternally provide a sweet scent worthy of the revered ancestor. et mea quo nosti carmina more fove. non monimenta patri, sed nova templa dedit. atque reportantes mella frequenter apes. Filial duty, direct your worshipful mind to this place again and support my poems in your accustomed fashion. Behold, Secundus is back once again, who, in a reverent frame of mind, gave his father not so much a monument, but a new type of temple. Calliope, you now force me, in a double path, to walk the ways that I had already passed: indeed, we gave a description of the great work: we mentioned the stones, polished and carefully arranged, the waves, running sweet through the adjacent groves, and the bees, that frequently bring back the honey. Here, in the inscription from Kasserine, the bees have become virtually the sacred priests that support the worship of the human dead. It is hard to imagine what a world without bees would look like, and we all should hope that it does not come to that. The loss would not only be a factual one – it would be a highly symbolic loss as well, a loss that goes to the core of a human symbolism that existed since ancient times. This entry was posted in Carmina Epigraphica, Epigraphy, Poetry and tagged Big questions, Carmina Latina Epigraphica, Imagery. Bookmark the permalink.